The mayor of Bugarach, Jean-Pierre Delord, poses at the village entrance. Image Sources: Time / Pascal Pavani / AFP / Getty Images. Hundreds of websites are claiming that after an apocalypse on December 21, 2012, only the small village of Bugarach, at the foot of this rocky citadel, will be left standing. ... Apart from the free publicity, one of the first effects of the end-of-the-world prediction was a boost to the village's real estate market. "Fifteen houses are currently for sale. 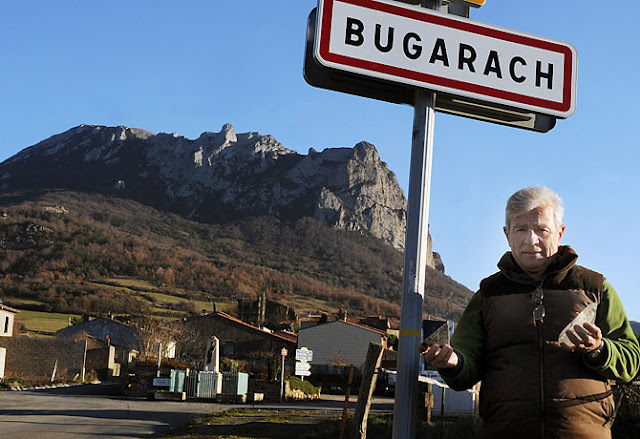 I have been mayor of Bugarach for 34 years, and I have never seen this before," says Jean-Pierre Delord. The prices asked are four to five times higher than usual. The tourists in the area have shifted radically in character from what locals call 'ramblers' to 'esoteric visitors,' many of whom occupy space around the town, chanting and meditating. The mayor has threatened to call in the army to protect Bugarach (population 200) through the last two weeks of 2012, in case 10,000+ people show up. The town has a long, peculiar history in this regard.